I mentioned a few weeks back that I was fortunate enough to make it through the lottery for the Cherry Blossom 10 miler. One of the really excellent things about this (in addition to getting to run it,) is the fact that they will give you a free training plan. All you have to do is sign up for the Beginner, Intermediate or Expert level. I went for the intermediate, as that seems to fit with where I was (As opposed to where I wish I was) the best. Today’s run was listed as a 2-4 miles, so 3 miles seemed the obvious choice! It was on a treadmill, so it was fairly dull. There is good news associated with today’s treadmill run however! I looked over the recommendations people have made regarding shows to watch and watched the first episode of “The Walking Dead.” Granted it was a bit slow to start (like the first episode of any series), but also had a good base to grow from. I’m looking forward to tomorrow’s run so I can see if he gets to Atlanta and finds Lori and Carl (his wife and child) – no spoilers please. I also want to say thank you to all of you that made recommendations for me! The running is feeling fine as far as hernia pain is concerned. I do still have some residual pain – but it seems to be the side that I didn’t have my surgery on, over the other side now. I have known for several years I would eventually need surgery on that side as well, so while its annoying – it isn’t surprising. The other side seems to be doing much better, which leads me to believe I didn’t rip it out. Some great running-clothes purchases this weekend, will post pictures later. But I suggest going to check out old navy and see if they have bright orange running tops on sale for a few bucks near you! ‹ #Janathon – Cake and Running Re-start. 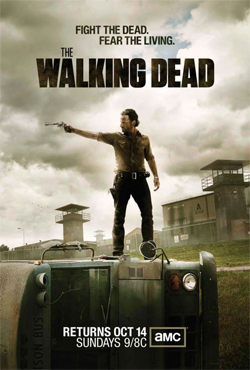 Have fun training for the race AND enjoy “The Walking Dead”! I’m a huge zombie fan and I must say this show continues to be one of the best zombie flicks I have ever seen. In fact, that tank scene at the end of episode one still freaks me out. I just watched it and now I’m freaked out! 😦 Whatcha running instead? Do they allow deferments until next year? The walking dead is freaking AMAZING!!! I can’t wait for the new season to come out! As for the running! I envy you! Telling you how much I’d love to be running that race just wouldn’t show you enough! One day, one day! & I always pick intermediate, I feel like I can’t run to win, but I can run. I’m super excited, I have always wanted to see the Cherry Blossom Festival -but living in NY it just wasn’t in the cards.. But now that I live 20 miles away? AND got picked in the lottery? I am SOOOO excited.